We've had such a mild autumn that my winterizing series has stretched on much longer than I intended it to. 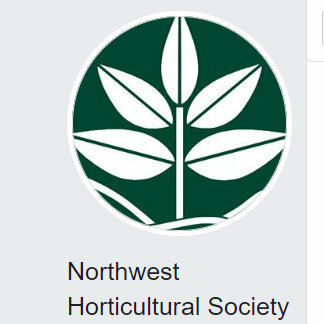 Currently a period of dry, sunny, days is upon us, which means we're looking at the possibility of a real frost...unless the insane east wind (flowing through the Columbia River Gorge) keeps things stirred up, in which case my garden might pass another week, or more, without a freeze. Because I can't resist sharing a bit of weather trivia: "the last time we saw 7 consecutive dry days in December was 4 years ago (2013). Back in December 2011 we went 9 consecutive days without rain so it’s a rare event but it DOES happen." Taking it even further... "Let’s assume we go 10 days without rain (a relatively big assumption at this point). That has only happened in 7 Decembers out of around 80 years of records at PDX. 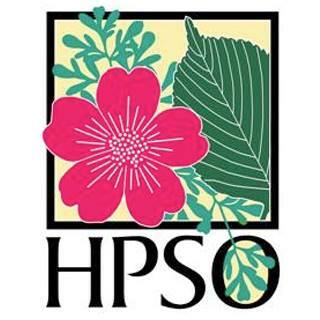 We had 11 consecutive dry days in 2009, and 14 in 2005 and 12 in 1989." (source) So this really is remarkable weather for us, sadly it's also part of the same system that's causing the firestorms in Southern California. So, back to the subject at hand...the garden and getting ready for winter. The final step in my process is to pull the things that (likely) wouldn't live though the winter in the ground. The Agaves below are some non-hardy pups from my brother in Phoenix. 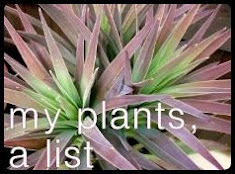 They are treated as annual "colorspots" (my version) and go in where I want a little drama in the garden. You also see the Passiflora 'Sunburst' leaves climbing up the tree trunk on the left. If I want to save that it's gotta get pulled and potted up. A few more Agaves and some random succulents. I could go either way with these Sedum nussbaumerianum. Take cuttings, or let them freeze. Dunno. This blue Agave of unknown linaiage was just a wee thing when my brother gave it to me. It's gone in the ground every summer since and then been pulled in the winter. These all stay in place...they're temperature hardy here and I've worked to be sure they have good drainage (something I don't do for the ones I tuck in randomly). The bottoms of the metal cylinders are all open to the ground beneath so the roots can run deep. More Agaves that stay, and a Haworthia (far right, bottom) that needs to be lifted. Are you wondering why I put things in the ground that aren't hardy? I like the way they look, or I've been given plants I don't have a place for, or plants pup and make more plants. All sorts of reasons really. 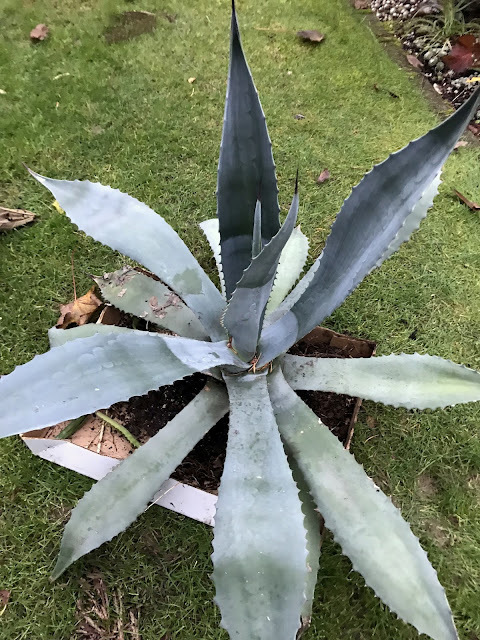 Here are a few Agaves after lifting. 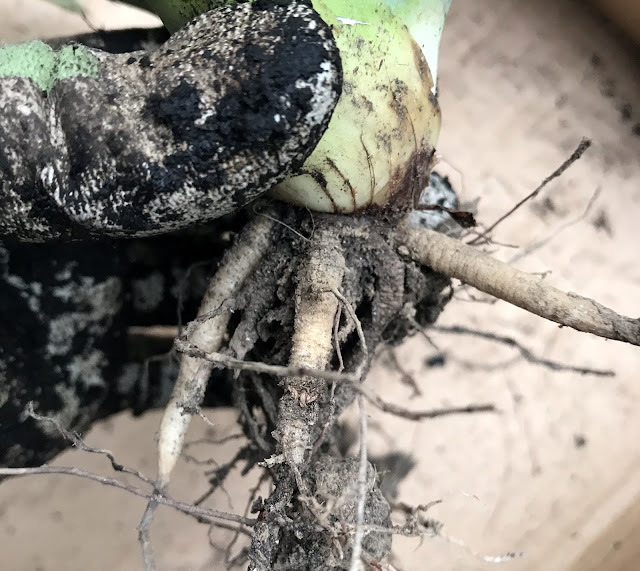 I don't work to hard to get roots, just take what easily comes with. I literally just grabbed this one by the base and pulled. I didn't end up with much but it doesn't care, Agaves are tough! This big guy required a little more than just tugging. I worked the soil around the base with a long screwdriver (yes it's a garden tool). Just a small root ball really. Oh and there were Aloes under it that I'd forgotten all about. 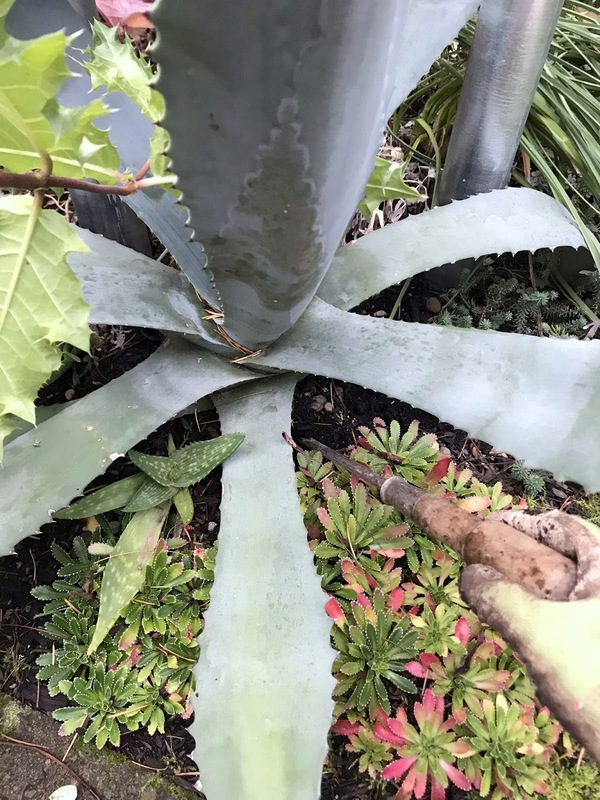 I guess the Agave put on quite a bit of summer growth. I decided to let this guy stay. I have no idea what he is, and who knows...he might make it! You've got to experiment every now and then otherwise there are no happy surprises. 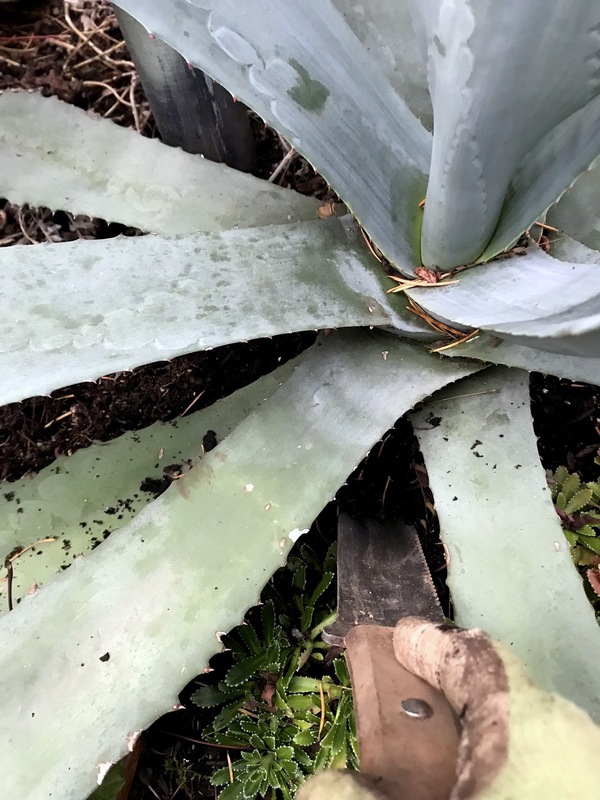 I like how he looks at the base of the palm, and had a tiny Opuntia of questionable hardiness live through last winter right there — you can see it to the right of the Agave, between two sprigs of Sedum. So what do I do with all these now bare-root Agaves? They get potted up in the stock tank vegetable garden. This area stays warmer than other parts of the garden — even in winter — and the soil is very free draining. 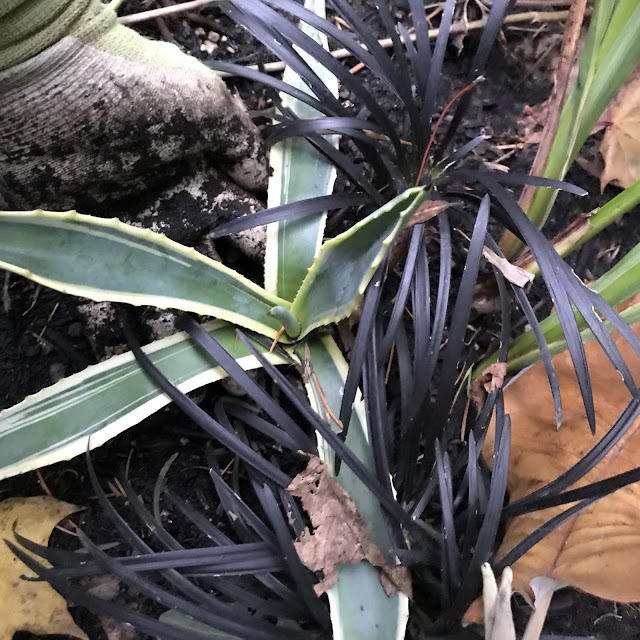 Hardiness is better for questionable Agaves when they can stay "dry" (drier? not as wet?). I also create little planting hills for them so the water runs away even faster. The orange line below is an attempt to highlight one. Still if things get really cold, like night-time temperatures in the mid to low 20's or staying below freezing day and night, then I can easily pull these and just toss them in nursery flats and take them into the basement to ride out the cold. Last winter was extreme and they were in the basement for a month, maybe longer. None of them minded. I also have a flat of Aloe maculata (aka Aloe saponaria) pups I cut out of a container. I might try wintering one of them in the stock tanks, but the rest will go into the basement. I may pot them up eventually...or use them in a vase arrangement, or...who knows! This Aloe distans 'Jeweled Aloe' had also made its way into the ground (a container reject that got too tall and had to be cut off). 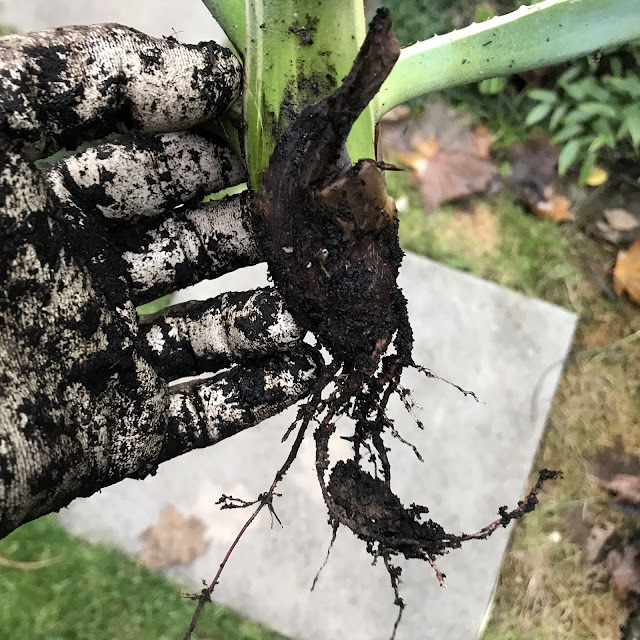 I pulled it a couple of weeks ago and was bummed to see it hadn't grown any roots. Ah well. Maybe next year. 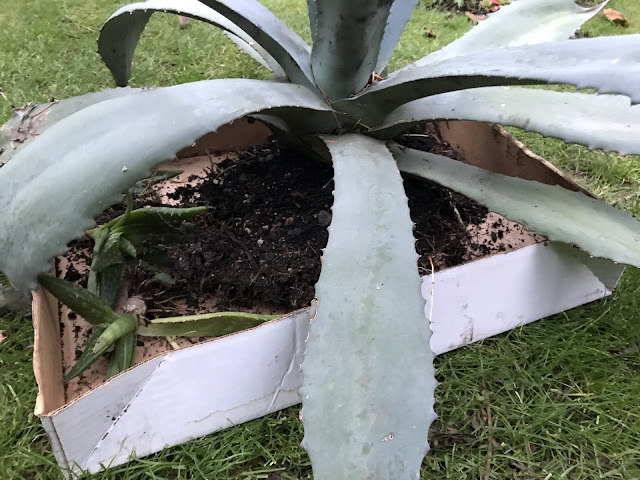 Do I leave any Aloes in the ground? This A. aristata will be sticking it out. And this larger leaf version. Why the torture? Because this one stayed right here all last (nasty) winter and was fine. It's that experimenting thing again. These Aloe striatula will also stay. I've got more in a protected container and I have had others of this species survive winter in the ground in previous years. They are way more likely (for me at least) to bloom next year if they manage to winter over in the ground. I'm experimenting by leaving this Begonia 'Little Brother Montgomery' in place, because I've got another one in a container that I can protect. It's been mulched very well. I did dig the Passiflora and pot it up. It's gotten this treatment for the last three years and done just fine. Of course there's also the insurance of the magical baby plant that comes back from the roots every year. It's a piece I (unknowingly) left behind in the first place I planted the Passiflora. It's in a crazy micro-climate right up against the house and by a window. It may be too late but I grabbed these and put them in the basement. I haven't pulled the Mangave 'Inkblot' yet though. It's right outside the front door so I might just leave them to be rescued at the last minute, should arctic air descend. The are looking really fabulous...and wouldn't it be nice if they overwintered right here? (dreamer, I really am a dreamer). I moved the Dicksonia Antarctica and Bocconia frutescens into position right by the back door. If temps drop they can be moved to the basement and then back out again when they rise. The Dicksonia Antarctica was our Christmas tree one year, it did not like being indoors that long. The Cyathea cooperii 'Brentwood' (aka Australian tree fern) will get the same indoor/outdoor treatment. As will the Grevillea 'Ned Kelly'. 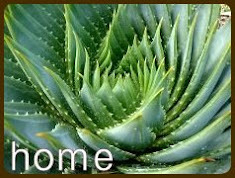 The Protea cynaroides will spend more time in the basement than the others, being less hardy. I will take it outside when the temperatures rise though. Protea do not like being indoors, I've learned that the hard way. Naturally I caved and cut the Sedum (and pulled the Haworthia). Who knows when/if I'll get around to doing anything with them, they'll be okay though. So there's been lots talk of taking things into the basement. Last "getting ready for winter" post I was frustrated by large hole at the bottom of the stairs. That's been taken care of...yay! (that black pipe — which looks like a can — will be cut off flush with the floor, when the plumbers are here next). The plastic walls are down and the Bromeliads have been allowed to stretch out and get some better light. It's kind of jungley down here! One last picture. I moved the final few things into the Shade Pavilion Greenhouse and got the heater and timer set-up working. Just in case. So far no need but I'm ready! Absolutely fascinating series of posts. The winter migration that takes place every winter, and the reverse in spring, is astonishing to me... 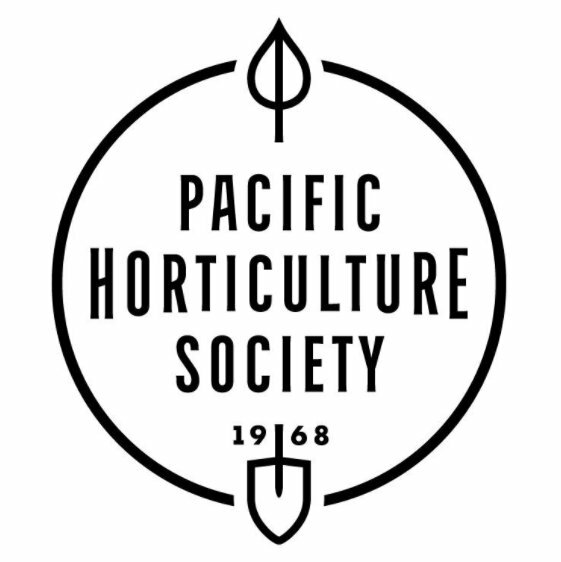 The vast number of plants you transfer... I'm in owe. The plants in the basement and in the greenhouse look ravishing and happy. "Dicksonia Antarctica" has a misleading name. Well it is the hardiest of the tree ferns! I know it looks like a lot of work but since it's spread out it doesn't feel that way...spring is a little worse though. It is work then! I won't complain about my paltry collection of plants that I bring in any more. 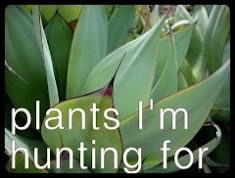 You have way more than I. I admire your persistence in keeping up with all of these plants. And here I complain when I have to clean up the garden after raccoons...I'm very impressed by all the effort you put into protecting your spiky friends. I heard this morning that our miserably windy, dry weather may continue through the weekend so, if our weather systems are linked, you may get that extension of your dry days. I read a depressing article yesterday that claimed that the melting arctic ice is a trigger for these high pressure systems that are preventing rain from reaching us. The article contended that we could expect more of the same into the indefinite future. Oh gosh, I'd be complaining too! Raccoons are evil. I need to come up with a decorative screen for my stock tank pond, otherwise I won't be able to have any plants in there next summer. The little turds wreaked havoc in there this summer. We're looking at clear and sunny through next Thursday at least, maybe longer. I pray the wind dies down for you all. 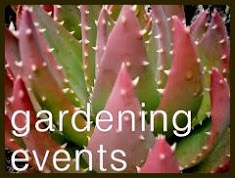 The reason your garden looks so good is your willingness to do all this work to help special plants survive. I am equally impressed and exhausted. Thanks Linda, it is an addiction that's for sure. The resilience of the agaves and other succulents is as impressive as all the work you do to winter over your tender kids. Your jungley basement garden is fabulous & it must be fun to do laundry in your winter garden down there. It's hard to concentrate on the laundry! 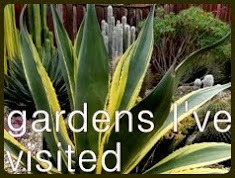 I’m encouraged to see how casually you can treat the agaves and they don’t mind. I still feel the need to baby their spiky selves, but apparently I could be far more ruthless in both planting them up and pulling them for winter. You've got a great way of looking at things Alan. I tried to take the photo from roughly the same angle I took the previous one, with the dirt. I agree it was a little confusing! The mild weather so far has awakened the sloth in me (think I've already lost a few things that should have come in weeks ago). You, on the other hand, are like an excellent teacher who pays close attention to the special needs of each and every student. Bravo! Well those words are kind, but I'm not sure I deserve them. You are amazing! Look at all you've done! What a nice thing it must be to go down into your basement and see your lovely plants safe & warm. Brava! And to think we made an offer on a fabulous CMU home with no basement. What would I have done!? I'm impressed with the work you do. The basement is looking very jungly indeed, and the Pavilion, snug and cozy. Good work, Loree! Thank you Eliza. It's a little bit crazy but hey, so am I! I love it all, and I really appreciate that you document the process! Those aloes in the ground must benefit from the passive solar heat exchangers surrounding them. This is the first year I've documented with such detail, and probably the last! 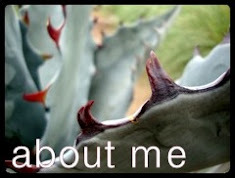 Those Aloes also benefit from excellent drainage, the A. aristata at least. Water just runs off those areas. You keep everything so neat! I hope it’s a mild winter ahead, so far so good! What is the pipe sticking out of the floor right in front of the steps?! I can't remember what the plumbers said that pipe does. I do know when they're back for the next step in the project (basement half bath) they'll be cutting it off level with the floor. Then I can put an area rug over it.